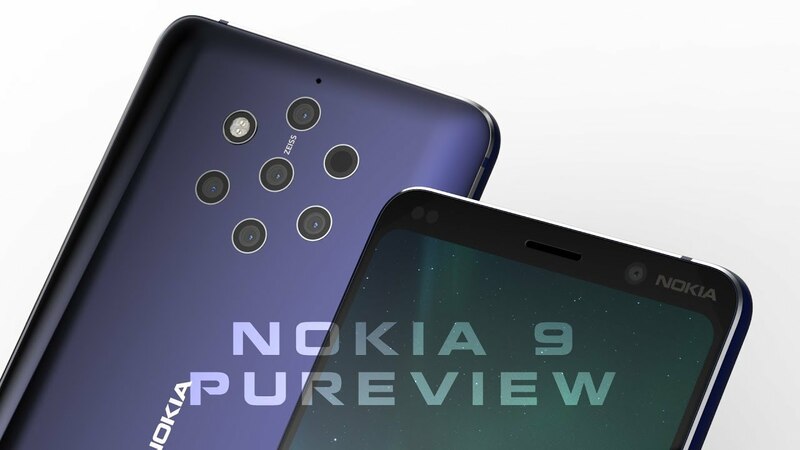 The Nokia 9 is expected to come with the octa-core based Snapdragon 845 processor made with 10 nm FinFETT technology clocked up to 2.8 GHz. This supports the Adreno 630 GPU. So the performance will be at its highest peak no doubt. Software section is also impressive as it comes with the latest launch of Google, the Android 9 Pie with the Android one program. The camera section, as mentioned before, is going to be extraordinary with the Penta lens camera setup on the rear. The leaked picture of the back side of this phones shows two more cutouts at the back. Experts are assuming them to be the place for the LED and Xenon flash. Among the 5 cameras, one will be the 41 MP sensor along with a 20 MP sensor and a 9.7 MP telephoto lens placed in a hexagonal shape. The other two are yet to be confirmed. The camera will support up to 4X zoom. The display is supposed to be a 6.01" AMOLED screen with fingerprint scanner under it. It will be the company's first under display fingerprint sensor phone. The battery is expected to be a 4,150 maH and non-removal. Well, all these specs are just rumoured and the launch will confirm all these. It is expected that the launch of the phone is delayed due to production issues. Same rumours came one year back this time. But no phones were launched by the company. Let's see if the company makes the rumours a reality this time or the phone is another dream to Nokia fans.